Atoms form the basis of electric charge creation. Atoms are the building blocks of matter, and they are extremely tiny. There are many billions of atoms in even the smallest substance, such as a grain of sand. Atoms have an equal amount of protons and electrons. Each electron has a negative charge and each proton has a positive charge. These two charges are equal, which means that each atom has zero net charge. As a result, it is electrically neutral. Like charges repel, which means that electrons repel other electrons and protons repel other protons. In addition, unlike charges attract which means that electrons and protons are attracted to each other. When a substance has a negative charge it has an excess number of electrons. That is, the number of electrons in the substance is greater than the number of protons. When a substance has a positive charge it has an excess number of protons. That is, the number of protons in the substance is greater than the number of electrons. In general, electrons are much more free to move around inside a substance than protons, and it is the flow of electrons to or from a substance which allows the substance to become either negatively charged or positively charged. A way to give a substance either a negative charge or positive charge is by rubbing another type of material on it. This causes the two materials to exchange electrons, and one of the materials gains electrons and the other material loses electrons. This phenomenon is due to the triboelectric effect. It results in one of the materials gaining a negative charge and the other material gaining a positive charge. For example, in winter you sometimes receive a shock when touching a doorknob. This is due to you gaining a positive or negative charge while walking on the floor. When you touch the doorknob you lose that charge. 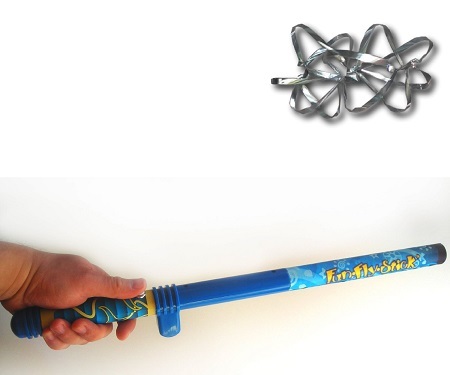 The fly stick uses the triboelectric effect to create a negative or positive charge on the wand end of the stick. This effect is created by a small battery powered Van de Graaff generator contained inside the stick. The generator has a belt powered by a motor, and this belt runs over two rollers. To understand the basics of how it works, consider first what happens with the belt and roller located at the bottommost position of the fly stick (closest to the handle). Due to the difference in material type between belt and roller, electrons are removed from one of them (either the belt or the roller) which causes it to gain a positive charge as a result. The other material (either the roller or the belt) then gains a negative charge as a result (since it gains electrons). The belt then, being either positively charged or negatively charged, travels to the wand end of the stick where it contacts the second roller (which is made of a suitably chosen material different from the first roller), and due to the triboelectric effect the belt then gains a negative or positive charge (opposite to before). This causes the wand end at this location to either lose or gain electrons, and as a result the wand becomes either positively or negatively charged. This happens through a rather elaborate set of steps (not described here). Lastly, the belt then travels back down to the first roller and the process continues, thereby sustaining the level of charge on the wand. In summary, the charge of the wand (positive or negative) becomes the same as the charge of the belt just after it contacts the first roller at the bottommost position of the fly stick. With the wand charged it can then be used to levitate the mylar strips. When the wand touches the mylar strips they gain the same charge as the wand. For example, if the wand is negatively charged it will transfer excess electrons to the mylar strips and they too will become negatively charged. If the wand is positively charged it will "pull" electrons from the mylar strips and they too will become positively charged. The like charges contained inside the mylar strips repel each other which causes the mylar itself to expand as a result. And at the same time the like charge on the wand and mylar strips cause them to repel each other hence producing the levitation effect. You can do a neat trick where you make the mylar strips jump back and forth between your hand and the fly stick. When the mylar touches your hand it loses its charge to your body and the ground you're standing on (which can be thought of as a charge "sink"). The mylar then becomes electrically neutral. At this point the mylar becomes attracted to the charged fly stick. This happens because the like charges on the fly stick and mylar repel each other and as a result the like charges inside the mylar physically move away from the fly stick. At the same time the unlike charges on the fly stick and mylar attract each other which causes the unlike charges inside the mylar to physically move towards the fly stick. The net effect becomes one of attraction since the closer unlike charges have a stronger attraction force than the repulsive force created by the (further away) like charges. Hence the net force is one of attraction and the mylar moves towards the fly stick as a result. When the mylar touches the fly stick it once again gains the same charge as the fly stick and repels away from it until it touches your hand, and the cycle repeats. It should be mentioned that the type of charge developed on the fly stick, either positive or negative, is something I do not know since it depends on the manufacturing specifics of the fly stick. But it can be fun trying to come up with a way to figure it out! Here's an informative video explaining the fly stick.